Do you think you practice healthy eating? Do you start your morning with a protein omelet without salt, and finish your day on a boiled chicken breast? In this case the following article will not make you very happy as it will dispel some of the misconceptions you were taught to believe about fat. A recent study in the US has shown that much of what we called "healthy food" has actually led to obesity and diabetes over the past some decades. It turns out that for several generations nutritionists have warned people against the negative effects of fat, claiming fat alone was the root cause of heart diseases and other ailments -- high cholesterol, high blood pressure and so on. Recent research points to the contrary. Cholesterol in food appears to have no effect in cholesterol levels in people's blood. According to the New York Times, people's fear of fat would have been promoted by the food industry as companies worked to push their low fat products onto the public and increase their market share. As it appears their health warnings against fatty products were motivated by their bottom margins and not scientific studies. The research showed that for the past 50 years the amount of fat consumption fell by 25 percent, whereas carbohydrate intake has increased by 30 percent. Fearing gaining excess weight many people have spent hours in markets, looking for products low on “fat”. But, what do contemporary doctors think of that? Fats are a vital part of the membrane that surrounds each cell of the body. If you avoid eating fats, then your body will itself produce saturated fats, contributing to raising cholesterol levels in your blood from proteins and carbohydrates. Therefore we should provide our body with unsaturated fats. Many people, especially those on “a diet” avoid eating butter, despite its great health benefits. Meanwhile, most nutritionist are now ready to confirm that the moderate consumption of butter does not harm the figure, and actually help individuals maintain a healthy weight. Fats play a big role in the ingestion and assimilation by the body of vitamins A, D, E, K. Therefore, if we avoid fats our skin and hair could get unhealthy. Fat is also very helpful (of course, in moderation) for treating stomach illnesses. The vitamin A contained in butter heals minor ulcers in the stomach, and, thanks to the "lubrication" a sick stomach recovers faster. That’s why we should not exclude fat from out diet but instead ensure that we use healthy fats. Based on your fitness level, 10-30 percent of the body weight comes from fat. Gram for gram fats are the most efficient source of food energy. Numerous studies in recent years show that those who constantly eat foods low in fat are more vulnerable to cardiovascular disease and diabetes. 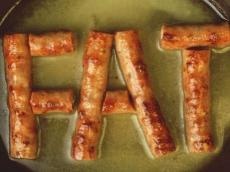 Do not be afraid of animal fat, because it is an important carrier of many vitamins and minerals. In moderation it helps ensure our body with essential kinds of fatty acids. Modern nutritionists prefers vegetable fats. However, not all fats have a positive effect on our body. The most beneficial of all fat is olive oil. Science has turned its investigative eye upon it and numerous studies have only reinforced the notion that olive oil is an amazing substance with numerous benefits. With all these trans-fat free products now on our grocery shelves, hydrogenated soybean oil has been replaced with palm kernel oil. This palm oil is in a lot of products that are supposed to be good for you. However, many specialists now advise not to eat anything that has coconut oil or palm kernel oil in it, as they are much higher in saturated fat - about 80%. They are not just useless, but also very harmful. It is not a secret that fats exceed other energy sources due to their caloric content. But, they make you feel satiated faster. So, by avoiding fats you essentially will make your body crave more food. Also remember that when manufacturers remove fat from their products they tend to replace the missing elements with sugar, salt, and flavorings. As we know a diet high in sugar and salt can be extremely unhealthy and damaging to the body. So, now it’s time to bring butter back to your breakfast. Remember fat is good for you!